West Bromwich Albion have pledged full support to the Barry family following confirmation that Gareth Barry’s 39-year-old brother died in a road traffic collision in Sussex last week. 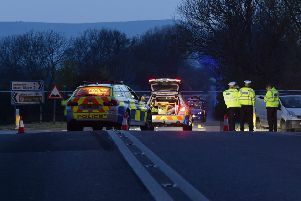 Marc Barry, 39 from Westfield, died when the white Mercedes Vito van he was travelling in collided with a black Nissan Qashqai on the A28 Brede Hill at about 7am on Thursday, July 19, a Sussex Police spokesman said. Gareth was granted compassionate leave following the incident on Thursday morning, before returning to training this week. He featured in a behind-closed-doors match against Brentford on Tuesday. Head coach Darren Moore said Gareth would be given full support from the club and further compassionate leave if required. Darren said: “This is terrible news for Gareth and his family and everyone at the club extends their condolences. Marc’s father Stan has paid tribute to his son. You can read that here. On Twitter, Gareth Barry’s former club Aston Villa Football Club also sent condolences and ‘best wishes to Gareth and his family at this difficult time’. Police are still appealing for anyone who witnessed the crash, or who has any dash cam or CCTV in the area, to report it online or call 101, quoting Operation Barbican.